‘Gasland’ is a documentary about the negative effects of natural gas drilling. The narrator in the movie is seeking answers about natural gas development in light of a growing play around his own home in the Delaware River Basin, and his inquiries take him on a road trip to communities around the U.S. that have already been drilled into and have something to say about it. 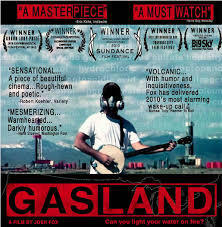 When the movie came out, it made big waves, and ‘Gasland-2’ premiers this weekend. Wyoming Public Radio’s Irina Zhorov reports on what’s changed since the first movie came out in 2010. IRINA ZHOROV: Josh Fox, the narrator and director of ‘Gasland’, went looking for people with oil and gas development in their backyards. In one scene, in Colorado, he follows a man to what looks like his basement and records as the man tries to set the water in his faucet on fire. Just give it a second. ZHOROV: The water suddenly alights. ZHOROV: A fireball hangs in the sink for a moment, and the camera pans to Fox’s shocked expression. ZHOROV: The film is full of such testimonies from communities across Pennsylvania, Colorado, Texas, and Wyoming. And when the movie came out it inspired more than a little curiosity about this thing – this drilling – that was happening in towns across America. JOHN FENTON: He gave them this word, fracking, that people are able to identify this with and it’s become this term that is so easily identified now. People know what you’re talking about when you say the word fracking. ZHOROV: That was John Fenton. He lives in Pavillion, Wyoming. Fox featured Fenton’s story in the movie. GASLAND: John Fenton and his wife Kathy have 24 gas wells on their property, all of them visible on their front porch…. ZHOROV: Fenton says ‘Gasland’ informed people about what fracking actually entails. FENTON: You see these fancy ads on TV with the attractive woman clomping through in her high heels and telling you how wonderful natural gas is, they’re so safe and the people on the ground, we’re seeing the opposite of that. ZHOROV: Fenton says his water went bad after wells went up on his property. He and some of his neighbors have been sharing their stories with whomever would listen for years. One neighbor, Jeff Locker, who also appears in ‘Gasland,’ says the film helped with their efforts. JEFF LOCKER: I think it’s had a huge impact, it’s brought an awareness to fracking and the drilling processes that goes on and everything that we’ve never had before. ZHOROV: Director Josh Fox doesn’t take all the credit for the drastic growth of citizen participation and involvement in discussions about fracking. JOSH FOX: I think there was a movement of people across the United State as a reaction to how invasive this industry was and that this film came along at the right time to sort of say, ‘Oh my god, this is happening in all these places at once.’ I can’t take the credit for that. What I think it’s like a Newtonian physics equation: every action will have an equal and opposite reaction. ZHOROV: Fox had hoped that the movie would incite industry to engage with the public about their concerns. Instead, Fox said they responded with adamant denial. He compared it to the way the tobacco industry reacted to early links between smoking and cancer. FOX: The tobacco industry spent decades deliberately trying to obscure that information and come out with bogus science, buy off studies and so on. And we’re seeing exactly the same thing happening from the oil and gas industry. I am not seeing a reform created by the industry. ZHOROV: Industry was not a big fan of the movie. What Fox sees as his truths, the Wyoming Petroleum Association’s Bruce Hinchey says were nonfactual, misleading and not truthful. But if 50 million people have seen the movie, like Fox estimates, did industry have to somehow address the issues ‘Gasland’ raised, even if it deemed them nonfactual? ZHOROV: Has it changed how industry kind of approaches conversation with citizens, with land owners. I guess I’m wondering if it changed how PR works for industry to any extent? ZHOROV: But industry didn’t quite stand by so passively. Several movies came out responding to ‘Gasland’ and refuting its allegations of wrong-doing by the oil and gas industry. At least one of those responses was funded by industry dollars. The Independent Petroleum Association of America took the time to critique Fox’s film and when ‘Gasland’ was nominated for an Oscar, they also cast their vote. FOX: They, like, appealed the Oscars to rescind the nomination. They practically handed us the Oscar. We didn’t win, but we had a chance at that point. I think what they’re doing is alerting a lot more people to the fact that they’re behaving in this way. ZHOROV: Fox also says lobbying efforts by industry and the money spent on them skyrocketed. But Fenton says no matter, the movie still accomplished what matters most. FENTON: Through the history of this country, where people been exploited, it’s not the government that changes that, it’s the people who are impacted that change that, the people who’ve been hurt, who’ve been damaged, are the ones who band together and who change harmful practices and harmful political stances. So I think that’s been the biggest impact from this is it’s empowered people who in the past thought I don’t really have a voice, nobody really wants to listen to what I have to say. And me including. ZHOROV: ‘Gasland 2’ delves into the role of government and regulatory agencies in oil and gas development. It premiers this weekend at the Tribeca Film Festival in New York. The movie will tour around the U.S. and air on HBO this summer. For Wyoming Public Radio, I’m Irina Zhorov.